When you were a child, you always heard that you should eat a rainbow. That’s why eating a wide range of fruits and vegetables is so important. These days, you can get veggies in almost every color under the sun. Just how important is the color of your produce? Here’s everything you need to know. Color has always been vital to having a healthy diet. In any meal, you need at least two colors of vegetables on your plate, if not more. This ensures that you’re getting a good variety of nutrients every time you eat. It also makes for tastier meals, as you’re mixing up flavors and creating new combinations that you’ll love. Of course, as the saying goes too, ‘the first bite is with the eye’. The more colorful your plate is, the better that meal is going to look. In modern times, produce is more colorful than ever before. Visit your local health food store Pembroke Pines, and you’ll see vegetables in colors that you didn’t know existed. For example, there’s multiple varieties of cauliflower that come in purple, yellow and green, as well as the regular white. Potatoes are red, yellow, and even purple in color now. There’s more choice than ever before. With so much choice, it can be confusing which produce to buy. Is there a benefit to the red peppers over the yellow ones? Do you want green tomatoes rather than red ones? Red, Blue, and Purple: These colors indicate that the produce is packed full of anthocyanins, which have antioxidant properties. They limit damage to your cells caused by free radicals in your body. They can also lower your risk of stroke, cancer, heart disease, macular degeneration, and memory problems. You’ll often have heard of tomatoes being important in the fight against cancer, and this is why. Red fruits and vegetables are high in lycopene, which can also lower your risk of heart disease and cancer. The compounds in these fruit and vegetables are perfect for protecting your vision and keeping your immune system healthy. They’re packed with Vitamins A, C, folate, and potassium too. 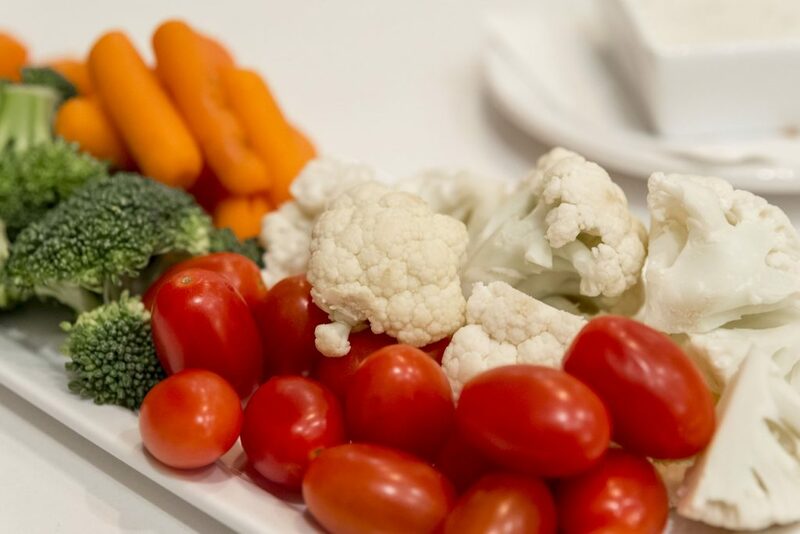 White Vegetables: These vegetables are white thanks to anthoxanthins, which are compounds with antioxidant properties. They’ll help lower your risk of heart disease and cancer. Some white produce such as garlic also contains allicin, which helps reduce your risk of high blood pressure and cholesterol, cancer, and heart disease. Some studies have found that consuming more white produce can reduce your risk of colorectal cancers. Orange and Yellow: This color produce is created by carotenoids, which you may have heard of being plentiful in carrots. These carotenoids are able to help reduce the risk of heart disease, vision problems, and cancer, as well as help, improve your immune function. Beta-carotene is a carotenoid that your body uses to create Vitamin A, so it’s an important compound to have in your diet. Green: Green produce is usually packed full of nutrients and vitamins, such as Vitamins A, C, and K, as well as folate. The produce gets its green color thanks to chlorophyll. This indicates that the veggies may contain indoles, which lower your risk for cancer, and lutein, which helps improve your vision. As you’ve seen, the color of your produce matters a lot when it comes to the nutrients found within. Every color offers something different, so you can start customizing your diet depending on what you need. Try talking to your local natural foods store Pembroke Pines. The experts there can help you find the produce that best suits your needs. Once you start buying more colorful veggies and using them in your diet, you’ll start seeing the difference in your general wellbeing. It’s amazing just how much of a difference they will make. Get using them today, and you’ll see what that mean.